It is Sunday. I think. The Mediterranean stretches out in front of me for as far as the calculations of Erastothenes allow. If my bearings were better I could point to where he was born from here. South is to my left. I think. I’m blissfully uncertain of many things. Day, time, location and the beautifully delivered undecipherable words of Liz Fraser in my ear. I stop reading for a moment to send myself a postcard (something I do occasionally when I remember to). I take specific note of the charteristics of the moment so to be better able to recall it later. With less precision than Arthur’s famous creation and with more attached feeling. This is nice. Somewhere behind me some musicians pump out some Polka that I only hear between tracks. In posh restaurants you get speciality matched wines with each course. Here it is the music that is brought along to compliment the array of schnitzel and sausage laid out above me. Pleasingly literal. This is me on holiday. Time away from work. The acceptable admission that, given the choice, you’d much rather do this all the time. The mass delusion that says you can get away from it all for two weeks without having to accept that being in the middle if it all most of the time is anything other than depressing. And yet, here I am content, almost relaxed. It is the slightly surreal juxtapositions that I find most joyous. All around me there are people sunbathing, swimming, drinking, eating, bronzed, burnt, glistening, mouthing along to the Polka tunes with open mouths full of partially chewed sausage. And here I am in the shade listening to ancient music on an ancient MP3 player reading about even more ancient times. And this is no filler. This is the main pursuit of the day. As the ship makes way through the sea, I make way through the book. Distance measured in nautical miles, time measured in pages. And it is perfect, the most surreal juxtaposition of all. This is the only time as ever do this. This is particularly surprising given how low the barrier to entry is. All I need to sit down, put on some music, grab a book and not move for hours. I could do this at home, particularly as this is a Sunday (I think). But never have. I could do this on other types of holiday. But never have. The only times I have ever sat for hours listening to music and reading is when I have been perched in the shade on a ship. It is easily one of favourite (and most relaxing) things to do. And I never (approaching zero) do it. Clearly, this is as much about balancing family life as it is about unbalanced thinking. We are, and as think I can probably speak for most of us, compelled to be doing something. Do you ever get up on a Sunday and say “I’m going to do nothing today”. I don’t. And yet, by and large, I still end up doing nothing, watching sport mainly. Although sneak in a walk here and there and that’s on the good list of nothing things to do. It’s even harder to do nothing on holidays. It has a sense of waste to spend money heading to far flung locations simply to sit on your arse and not enjoy and experience the new things nearby. And, obviously, there are others to keep happy. This music/book nexus isn’t necessarily for everyone in the gang (although my gang are all blissfully readers too). 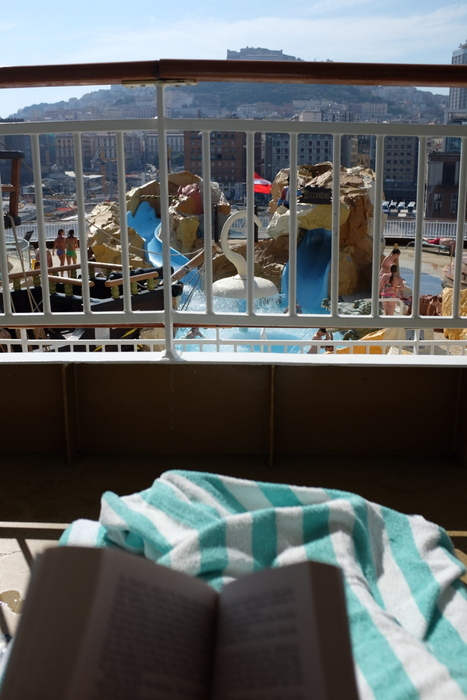 But this is specifically why holidays at sea are perfect. Everyone is happily doing something thus allowing me to do nothing. So I pay money to travel afar to enable me to do something I could do in my living room any time for free. The wondrous contradictions. Like the fact that I mostly listen to The Fall on such holiday occasions. I suspect Mark would hate the idea of his barking being used as a holiday soundtrack. And not just because he doesn’t seem to like much at all. I once read Renegade on a ship only listening to The Fall while people carved ice and folded towels around me. He’d hate this, I love it. Corona? It is the kind of odd, jarring soundtrack choice that only Tarantino can make work. I will do this again. And maybe, just maybe, I’ll try it at home one day. Wonder how that will be? Hang on, it’s been an hour, better have more melon. The image featured at the top of the post is of the library at Ephesus, seemed appropriate in a post about reading.